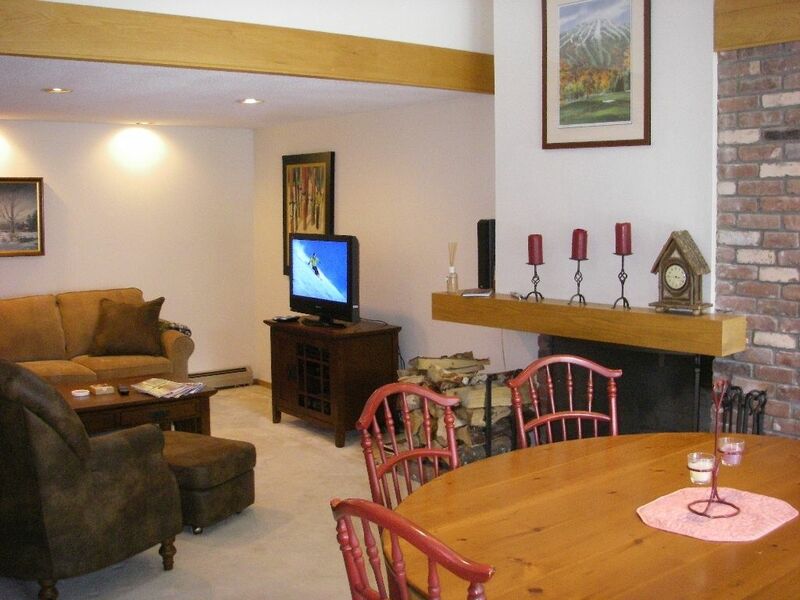 Lovely Intervale condo located in wooded area off Stratton Mountain access road (just 3 miles from the base lodge). Spacious living/ dining area with brick fireplace. First floor master bedroom with full bathroom . Upstairs has two bedrooms (one with a private full bathroom), a hall bathroom, and a loft. This is a nice town house ,we use it every weekend it is not rented. It has been updated in many ways and has been kept up over the years. It is very comfortable and warm. This house is perfect for one or two families and their children or a small group of adults. It is just off the beaten path, away from the hustle and bustle of the mountain. It is only three miles from the mountain and has a free shuttle.I'm sure you will enjoy your stay . We have stayed at other Intervale properties before and this one is the best. right on it and had it fixed while we were on the slopes . He is very accommodating and easy to deal with.We are looking forward to booking again in the future. Thanks Gina glad you guys had a good time ! My wife and I have stayed here for a few days in the winter of 2013 and 2014, and we've booked some more dates for 2015! This condo is literally perfect in every respect! It's super clean, up to date, a 2 minute drive from the mountain, and has that cozy mountain feel you expect when taking a ski trip. John has always been an absolute pleasure to deal with as well. He's very responsive (both before and during your trip), easy to deal with, and he's given us great food and activity recommendations. My wife is in the residential real estate business and has VERY high expectations when it comes to hotels or lodging...with that being said, she fell in love with this condo, and won't stay anywhere else now when we come up to VT. The pictures don't do this place justice! Very highly recommended. My family stayed the weekend at this lovely, clean condo. It was homey, well stocked, close to the mountain and a great rental. I would definitely come back again!!! The owner was gracious and very easy to work with. HIGHLY RECOMMENDED!! Nice set up, loved the fire place. Super clean w/ plenty of room for 4 adults and 4 children. Well stocked utensils, pans etc in the kitchen, very nice amenities. A pleasant, quiet unit convenient to the mountain, driving or shuttle.